Most people love to buy a good ride that is top notch, and that, which would be a thing to be proud of when people discuss it. But sometimes you don’t have the means to get the brand new, and it seems all the used cars that you see around, are just too expensive- and everyone knows what it means to adequately make all the ends meet. At other times, anyone would think they’ve found a good buy- the price, the seeming ruggedness, and most likely also, because all of the gas pedal, the lights, and the brakes, seem to be pukka. But even still, many traded used cars develop serious faults, just few weeks to their purchase, and you’ll be thinking it was all too sudden. What happens is that they had always had that issue or they were on the verge of it, but some dealers don’t bother to tell their customers all of the real details. The Del Toro car dealers have been in business for a while now, with a proven track record for selling only the best used cars, whose conditions have been verified, and certified okay for the new user. This is because the company believes everyone in Auburn and everywhere, deserves to enjoy their cars- whether they got it new, or used from a resale store. 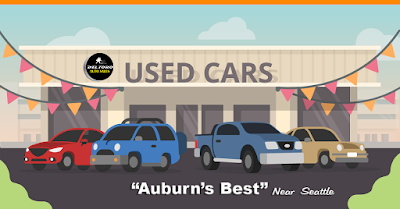 If probably you did not know, there is the Del Toro used cars sales point, where you get the best used cars in Auburn, WA just like they were brand new. And what’s more? Nobody needs to break the bank to get a really good and decent one. Since Memorial Day is around the corner, the company has decided to do the big one. All through the weekend from Friday the 25th through to Monday the 28th Memorial Day, there would be a huge sales of used cars, that comes to you at an obvious discount. Definitely, this could be a good way to celebrate memorial day- especially if you have your family or friends to cruise around town with you. Don’t forget, all the cars are tested and verified okay before sales, and it’s just 30 seconds approval, once the order is made.